Upload Thursday. Nothing for Me! This is tempting me. But I’m waiting for the Gratitude Wrap! Ok, besides there not being a Gratitude Wrap (yet) I’m super disappointed in these online exclusives. 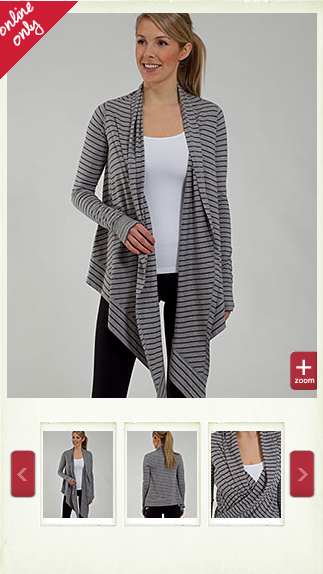 Of all the 2009 items they could have brought back that would have made many people happy (Dance Pulse Wraps, Sport Cardi to name a few) I don’t think the Oasis Wrap had anyone wishing for a comeback. Nice as it may be, it’s just not special enough for hype. For the hype up of the Facebook tease you would think they were uploading something not just ho hum but something really exciting. I would have been really happy to see a Dance Pulse Wrap or a Lux Hoodie but the Passion Crops are really something I need to try on and not a must have right now item. I was tempted by the Silverescent Hot Class Tank momentarily but I can just check it out at my local store and give them the sale. I’m really not even tempted to go to the store either though unless I hear of a Rubber Ducky Scuba hitting shelves (Lululemon Coquitlam…please call me if that happens ;p) I need not rush out. 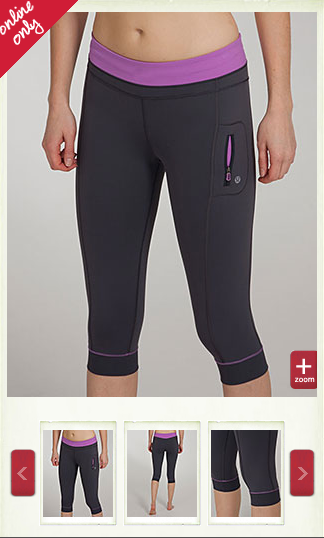 The Lululemon Exchange page is now calling my name. Does anyone feel our chain is being yanked with the Oasis Wrap? Did you buy anything today?